Gothic styled costumes are always a great choice, come Halloween night; on the night when the dead supposedly rise from their graves to walk the earth, no costume in the world should seem more appropriate then a darkly gothic costume. And we, here at Medieval Collectibles, are here to offer you a tantalizing selection of men's gothic costumes. 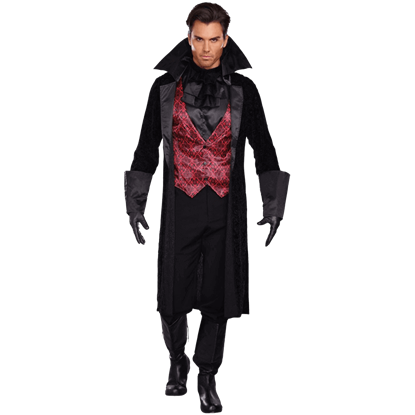 If you want to walk among the dead, our men's gothic costumes contain a selection of extremely appealing vampire costumes: ranging from downright noble to slightly amusing, our gothic vampire costumes are sure to make any man a heart-stopper. But they are not the only good costumes in our men's gothic costume section. We have also got gothic noble and ghost costumes, as well as a number of dark, yet mystical sorcerer costumes that confer a mysterious and powerful look not to mention they make you look pretty cool, as well. 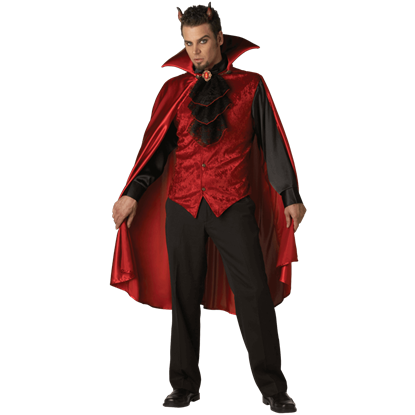 So if you think that gothic style is the way to go this Halloween or for any costumed event, really then you need to browse our men's gothic costume section; you will not be disappointed. 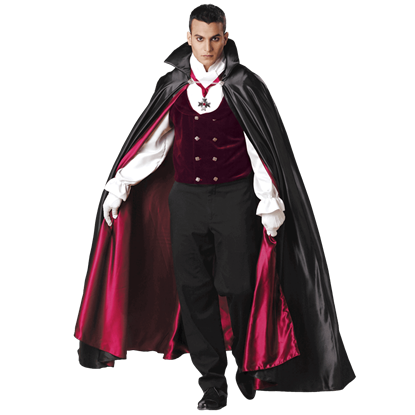 This vampire costume is the perfect blend of old world style and gothic imagery. 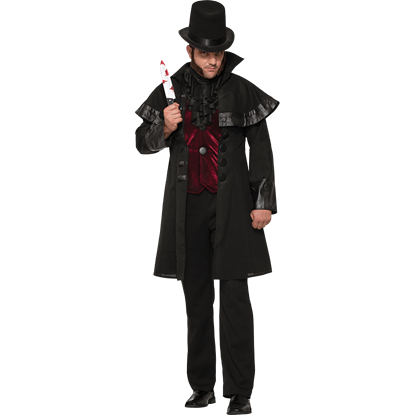 The Baron Von Blood Costume is for a modern vampire who desires a touch of elegance in their wardrobe with colorful and distinctive gothic influence. 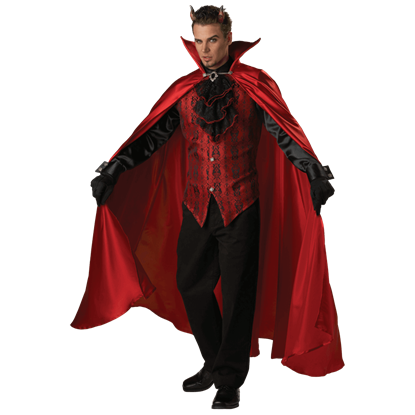 This vampire costume is a perfect blend of old world style and gothic imagery. 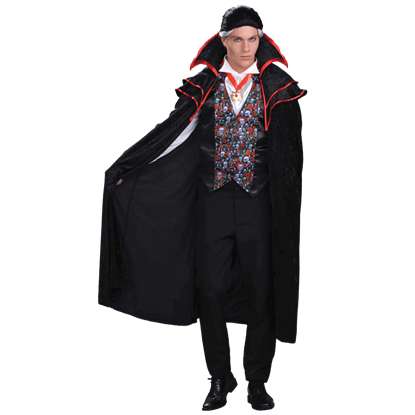 The Baron Von Blood Plus Costume is for a modern vampire who desires a touch of elegance in their wardrobe with a colorful and distinctive gothic influence. Everyone will want to nibble your neck when you show up wearing this Bloody Handsome Mens Costume. Displaying a regal silhouette suited for any preternatural party, this Victorian vampire costume pairs well with a bottle of red. 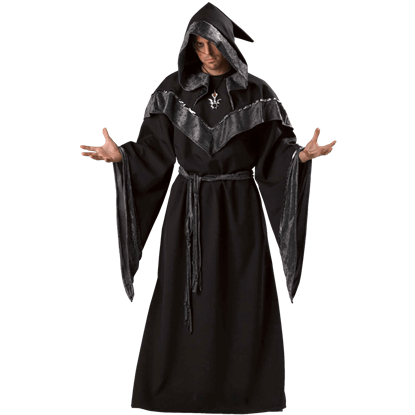 Unfortunately, the donning of the Dark Sorcerer Men's Costume does not confer knowledge of any dark arts, so there will be no turning of random people into frogs or smiting them with lightning. It does, however, make you look very cool. The Dashing Devil Men's Costume certainly lives up to its own name. It can take a man and turn him into the boldest of fiends, the foulest sort who tempt mortals for fun and make nefarious deals, akin to what you want most for a soul. Very few can say that they got the last laugh, and the man wearing the Evil Jester Costume indeed did. 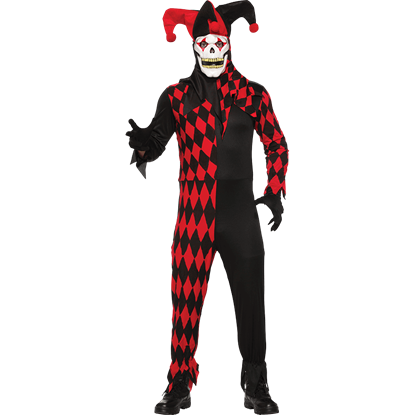 With this frightening ensemble, you can combine the lighthearted nature of a court jester with traditional horror elements! No matter if it is a mortal occasion or undead soiree, there comes a time when even a skeleton requires formal attire. 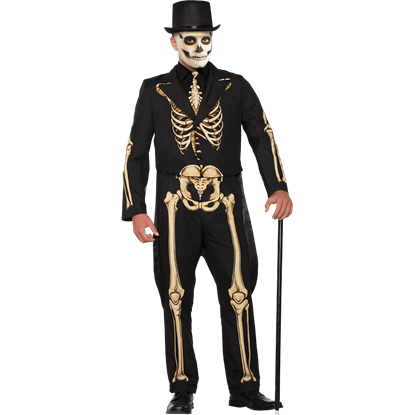 When that time comes, adorn yourself in the Formal Bones Costume to express the skeletal being that lurks within! Depending on the influences, a vampire is not hard to do as a costume. A modern one can apply fangs and fake blood, and be done. But a classic gothic vampire is more challenging. For this there is the Gothic Vampire Men's Costume. Nothing is quite as daunting as staring down the Angel of Death. Many fear the day he comes for them while others are shocked at his arrival. 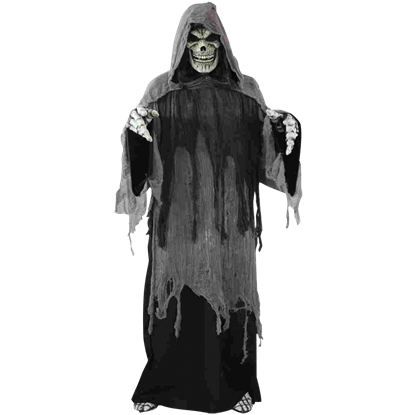 Instill that fear into the hearts of friend and foe alike with the Grim Old Reaper Costume! Even a devil can be attractive in appearance. The phrase devilishly good looks had to come from somewhere, after all. In the Handsome Devil Men's Costume, any man can show off his devilish charms, dressed in a devils own finery. The Leather Apron. The Whitechapel Murderer. Jack the Ripper. All these names identify the man who left Whitechapel, London in chaos. Known for his ambiguous nature, the Jack the Ripper Costume brings this heinous being to our day. 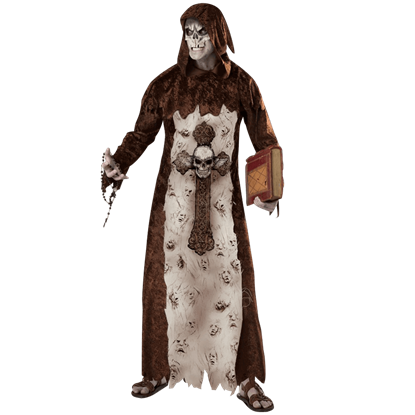 Lead your flock towards the gates of hell while arrayed in the Keeper of Lost Souls Mens Costume. For the priest who forsook his holy orders and dabbled too much in the dark arts, this ensemble is the first choice in Halloween apparel.